This article was originally written by Jordan McArthur and has been updated for relevancy. When you make use of an event app, you’ll benefit from the event app metrics that are generated by your attendees. By understanding the way your attendees are navigating your event app, you’ll gain valuable insight into the types of actions and behaviors associated with navigating your actual event. The information you collect from your event app metrics will allow you to draw conclusions about the flow of the event, which aspects were the most (and least) popular, and – most importantly – provide a window into ways you can improve your event the following year. Did people use my app? How can I improve my app for the future? Should I adjust my promotion strategy? There’s a lot of talk in many industries today about “big data” and its perceived advantages and disadvantages. For event professionals, however, the truth is that more data means more understanding. And since event app metrics are collected as an aggregate of your overall attendees’ actions – as opposed to being collected on a per-attendee level – they never pose a privacy concern. The numbers simply allow you helpful snapshots and unprecedented access to the inner-workings of your event. Let’s take a look at the 5 main event app metrics and how you can use those numbers to help make your event the best it can be! When users select items from your main menu, they’re actually telling you a lot about what type of information it is that they’re looking for when they open up your event app. If your networking features are within the top 5 menu items, you know that one of the main reasons people are attending your event is to connect with one another. If that information is a surprise to you, it’s easy to react and either create more opportunities to network – or optimize your event app to showcase your networking features. Many Guidebook users will use this metric to help them arrange their icons on the menu. The most popular items get priority over others. Lists house some of the most important information in your event app – they are basically the building blocks by which the app is constructed. Sponsors, speakers, and vendors are all catalogued within lists. By measuring the number of times each one of those items is viewed, your event app is effectively able to tell you which of those sponsors, speakers, or vendors are most popular. This can go a long way towards providing ROI statistics to your sponsors, or even determining your own ROI on keynote speakers. If you’re looking to gather some data on a specific aspect of your event, try creating a list and cracking open the data. If, for example, you’ve sold a number of food truck slots and wondering which one was most appealing to your attendees – consider making a list of them within the app and analyzing the list item views after the event. The possibilities are endless! Just as important as list items are schedule items. If list items are the building blocks of your app, schedule items are the building blocks of the event itself. You’ve spent a ton of time creating a schedule that you think will appeal to your attendees – but the only way to know for sure how attendees are responding to the schedule is by measuring their reactions to it. The top viewed events can be some of the most useful metrics when optimizing your event. If you check the stats before the event, you might be able to avoid disappointment by adding a second session of a popular schedule item. When you check the stats afterwards, you might be able to narrow down a particular topic that didn’t really resonate with your audience due to its lack of views. Drill down on this engagement metric to determine what resonated with your audience the most. This information can give you a clear picture of what your attendees liked and disliked, which is powerful information that you can use for your next event! The type of device your attendees use can actually tell you a lot about who they are. Perhaps most importantly, however, knowing your iPhone v. Android numbers will give you a heads up as to how to optimize your app, mobile site, and other mobile efforts you’re providing at your events. When building your app, it’s a good idea to preview it on both an iPhone and an Android phone. This will eliminate any surprises of attendees complaining about device issues and you being stuck without a visual to help them troubleshoot. The only thing to keep in mind with your percent adoption is that sometimes it’s a more accurate measurement of how well you marketed your event app, rather than the effectiveness of the app itself. If you want a fully accurate picture of how many of your attendees will use an event app, make sure you’ve done everything possible to promote it in the first place. You want to make sure that your attendees aren’t just downloading the app and checking it out once — you want engagement! By looking at your adoption rate as the start of your event nears, you can see if your current promotion strategy is effective, and make adjustments if necessary. In general, you want people to download your guide at least two weeks before your event. 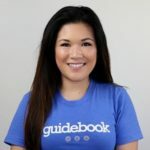 If you’re ready to turn your attendees’ behaviors into actionable data, start building a guide with Guidebook Builder today. It’s free to try and extremely easy to use!